If you like to keep your information private, there’s never been a better time to save that info on your Mac and iOS devices: The Apple market is chock-full of products that help you securely store—and easily retrieve—everything from passwords to credit-card numbers, including one, dubbed iCloud Keychain, that Apple itself is busy baking right into OS X and iOS. The latest option I’ve tried is Passwarden (Mac App Store link), an OS X app built by DAR Software that promises to help you manage every last bit of sensitive information, in a secure way, with as little complexity as possible. Passwarden is easy to install and set up. The app—a free download—requires you to create an online account before you can store your data. You then use this account to synchronize your data with other Macs running the app and with iOS devices running the free companion iOS app. Once configured with your account, Passwarden allows you to enter any number of records, which are divided into seven different categories, including logins, banking records and credit cards, photos, contacts, and notes. According to the company, this data is stored using an alphabet soup of encryption algorithms that mean business, such as the government-grade AES–256, which protects your information using a key derived from your password. Rather than just using the same generic template for each record type, the app supplies a variety of templates designed to better match each specific kinds of data. 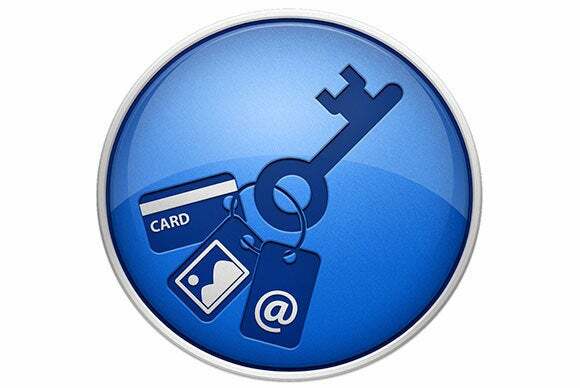 For example, Online Account records can contain social-network logins, Apple IDs, e-mail accounts, and so forth. This approach helps you input your details without confusing you with fields you don’t need, or cluttering the app’s interface with myriad different options for every record. Unfortunately, Passwarden’s many features are somewhat hindered by its unpolished user interface. A lack of consistency and focus make it difficult at times to discover how the app works. Just as an example, it took me a while to figure out the correct way to add a new category to my account. I initially thought that I could do so from the Categories menu, but, despite my efforts, that menu’s contents were always disabled. It turns out that you need to hover briefly over the Categories heading in the left-hand sidebar of the app window, which causes an Add link to appear. Once you discover this, Passwarden’s approach is actually more convenient than having to use a menu-bar menu, but it’s not at all obvious. On the good side, Passwarden’s developers have made an effort to ensure that the app’s functionality is never too far from your fingertips. In addition to it main window, you can access Passwarden through a systemwide menu, as well as from within Safari, Firefox, and Chrome thanks to available browser extensions. Once you go over the limit, or beyond that one-month trial period, things quickly get confusing. 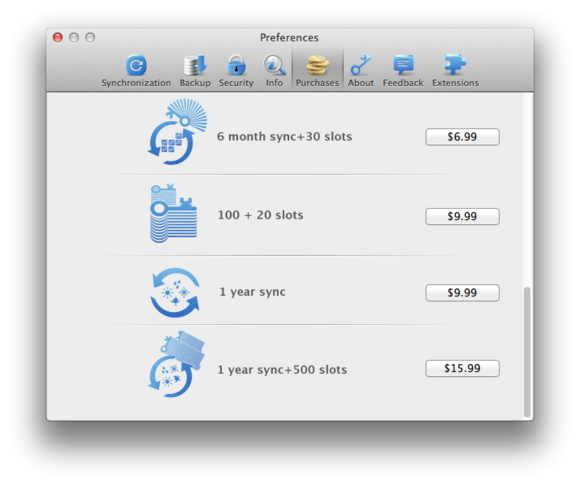 You can extend your sync privileges, and increase the number of records you can store, using in-app purchases, but because these two limits—storage capacity and sync subscription—are handled separately, you have to choose from a list of ten different in-app-purchase packages! Confused yet? These aren't even half of the possible add-on packages you can purchase from within Passwarden. Confusion aside, Passwarden’s plans are reasonably priced: Even the most expensive package, which gives you one year’s worth of syncing and 500 record slots, costs only $16, which compares favorably to most competitors that offer similar features. The complex web of purchasing options, however, is bound to scare potential customers away simply by overwhelming them with too many (confusing) choices. 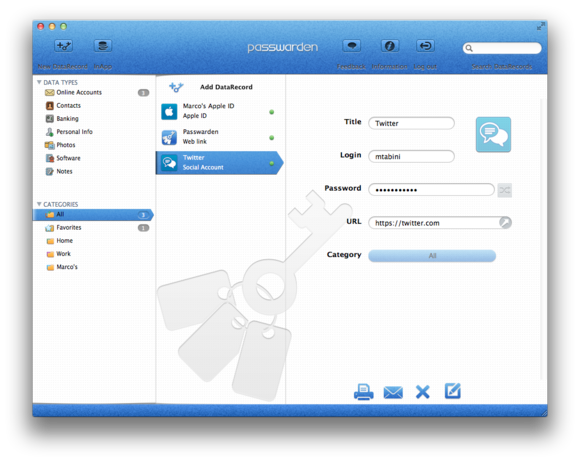 Passwarden isn't the best password manager on the market, but it has a few interesting features and, despite its flaws, does many things right.